Recently installed by our team a 40 x 65 container structure, functions as a transport truck repair facility. 14′ X 14′ Steel Roll Up Door with a chain drive & a standard Man Door on the front wall. Located in Mississauga, ON. The natural lighting which is diffused by the outer vinyl cover creates a very visually effective and pleasant work area for employees to work in. The fabric cover also works very well for branding & advertising. 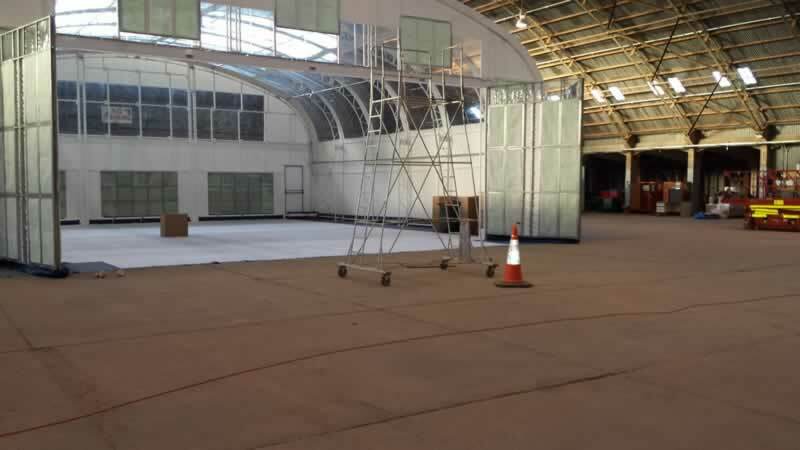 Installed by our own team a 50 x 80 container structure, functions as a storage area. Six weeks from receipt of order till installation. Located in Prince George BC, this is our second project for Canfor Paper & Pulp since 2015. High snow load impact was eliminated by spacing trusses every 5ft. Customer very satisfied . 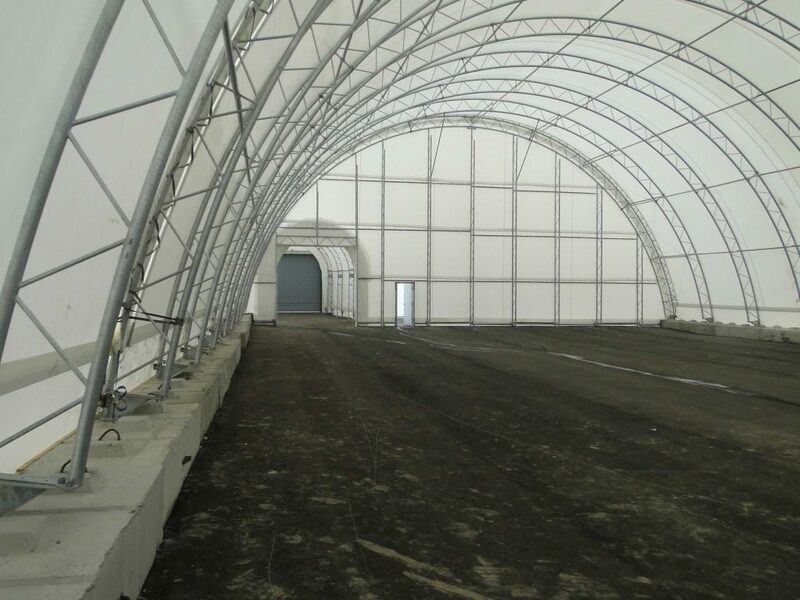 CN Rail required a structure to house and work on some of its very large and heavy equipment. This 50′ high and 50′ wide structure was custom designed to sit on 9 shipping containers 53′ long that are stacked 3 high. The 35′ high sliding doors close or open a span that is 50′ wide. The lower containers will be used as office & storage space. Another Steel Clad Canopy for Canadian Tire. XLSHELTER Recently completed a customer service canopy in Bradford Ontario. This canopy is engineered for snow and wind loads specific to it’s location. The steel roof and posts are powder coat painted to match the color of the existing structure. Mounted on concrete sauna’s the front concrete is elevated to protect the steel posts This structure allows customers to load and unload purchased products, protected from the elements. 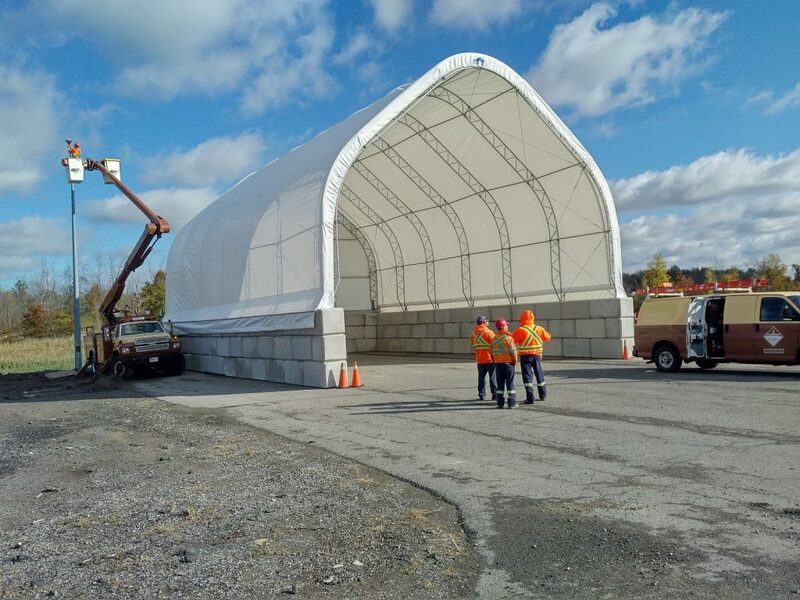 This 40′ wide x 60′ long “high profile contour style” salt storage structure for the Ministry of Transportation of Ontario is engineered for snow and wind loads thru most of Ontario. The structure is located in Port Colborne Ontario. 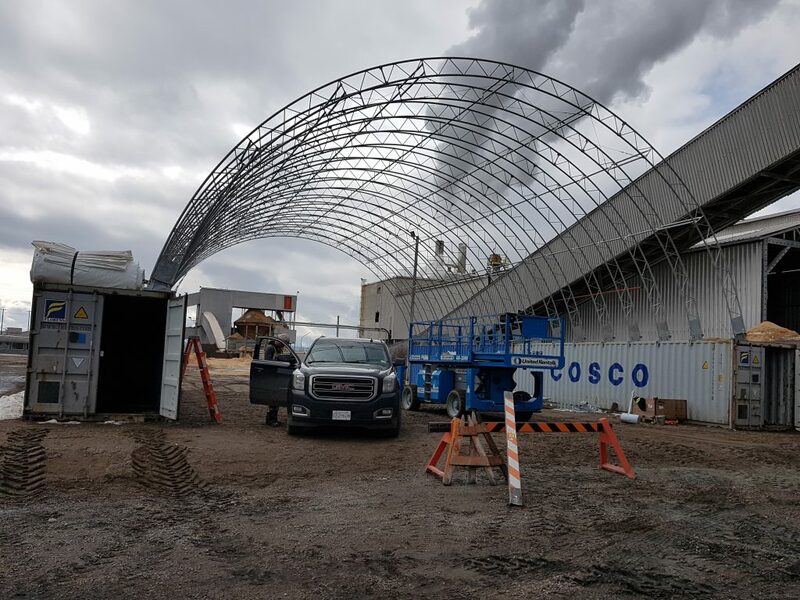 This structure will be relocated to a new site next year once the Ministry builds a new facility for sand and salt storage. 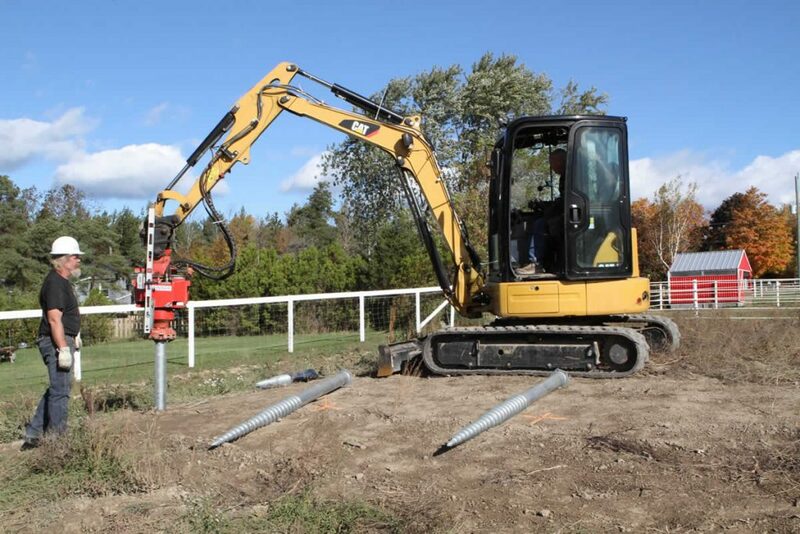 Engineer certified “Lock Block” system for footings at 7.5 ft high were used for this particular structure. 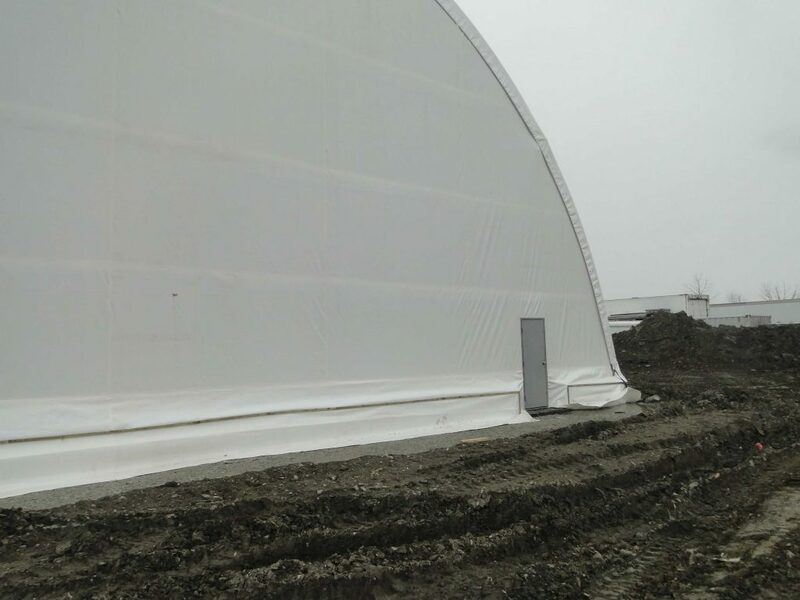 Customer needed a place within perimeter to create a safe zone from the elements. XLSHELTER provided the design, engineering, and installation. This structure uses precast concrete blocks as a economical footing system. Since this structure is open at both ends a vehicle can drive thru on the taxiway. 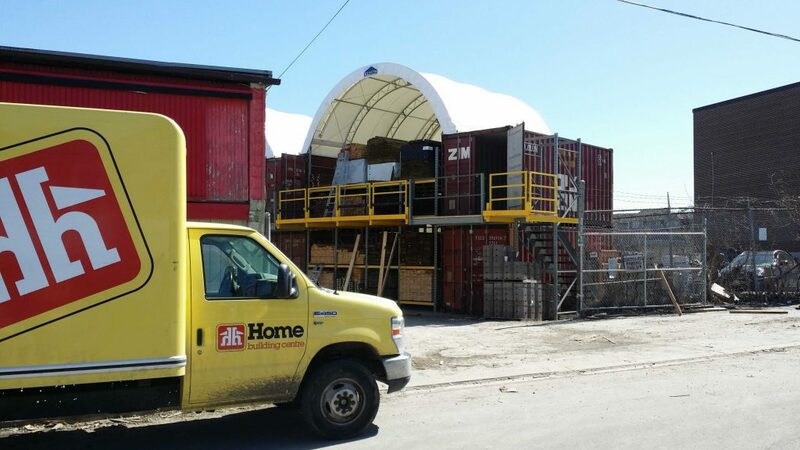 This XLSHELTER container building is set up in Cochrane, Ontario. 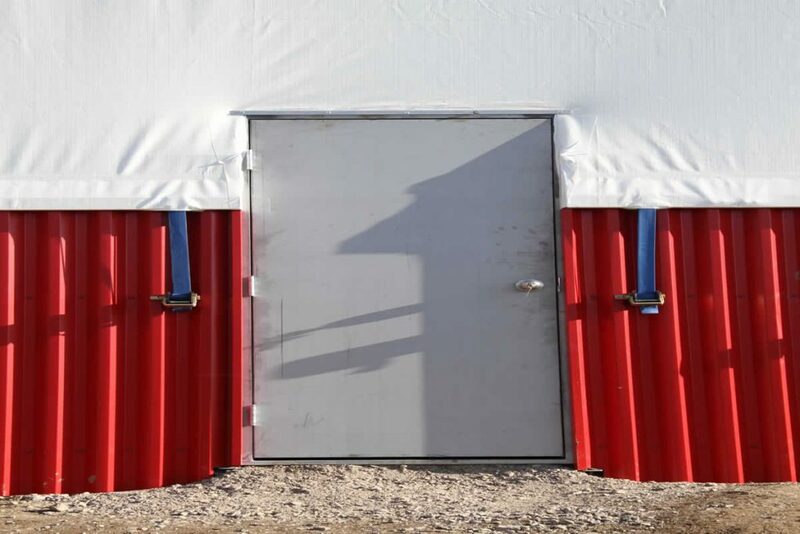 We use standard sea containers that act as a foundation for the building. 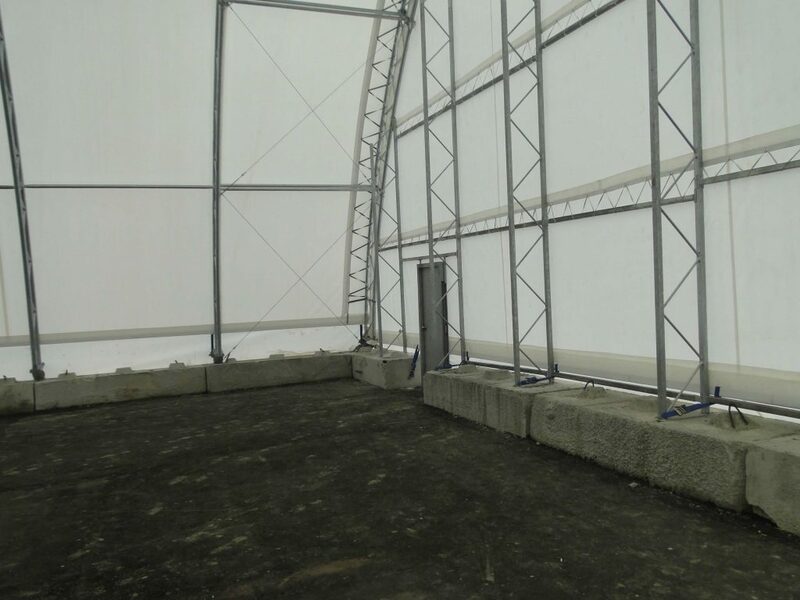 This structure is being used by a construction company. It provides a secure storage area and an ideal work area. The containers are used for secure storage of tools and equipment. 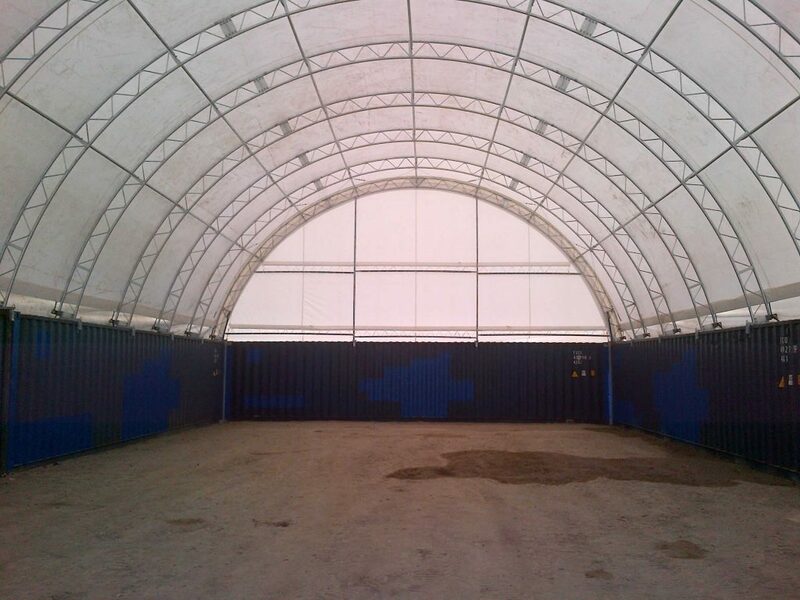 We offer container structures in sizes that range from 20′ wide all the way to 60 ft. 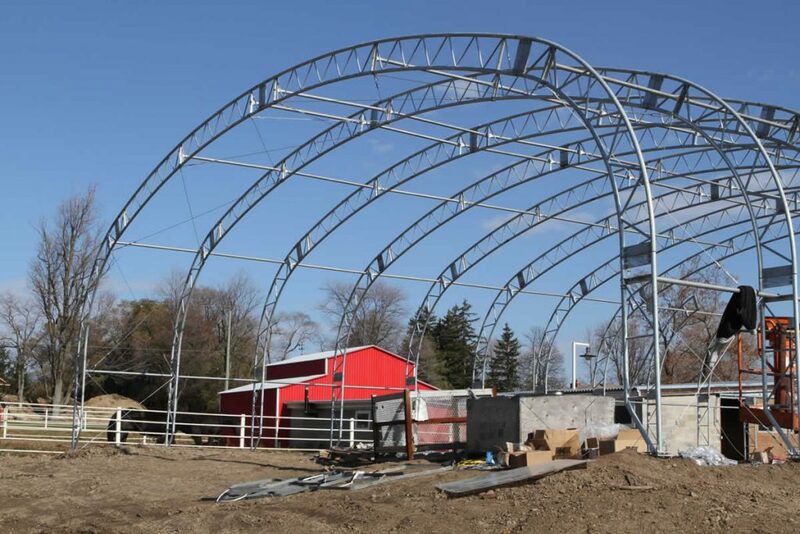 This XLSHELTER is for a horse farm in Grimsby Ontario. 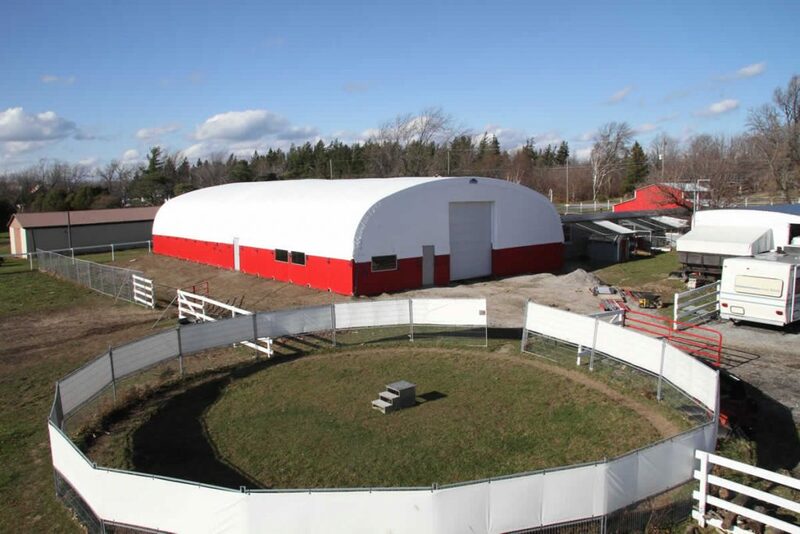 A fabric barn has many benefits, such as natural lighting, portability and economy. Maintenance costs are negligible. Aesthetically this style has some advantages. 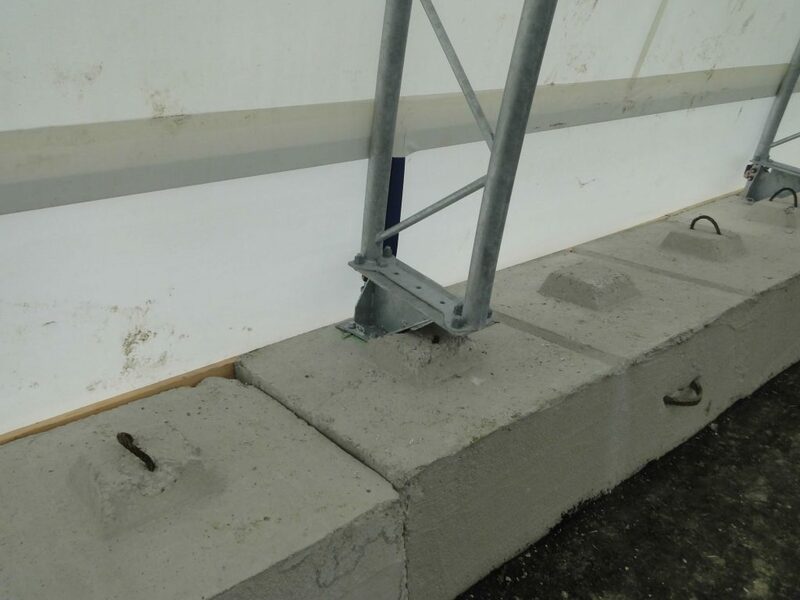 On this project we used a 6ft long anchor to support the truss bases. We also clad the sides with steel siding. 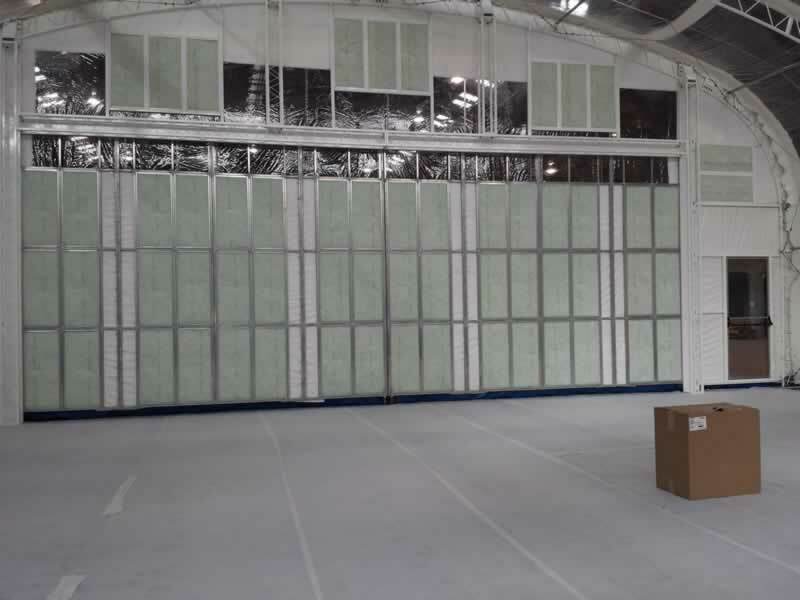 Steel roll up doors of various sizes are available. The owner is very pleased with this set up. 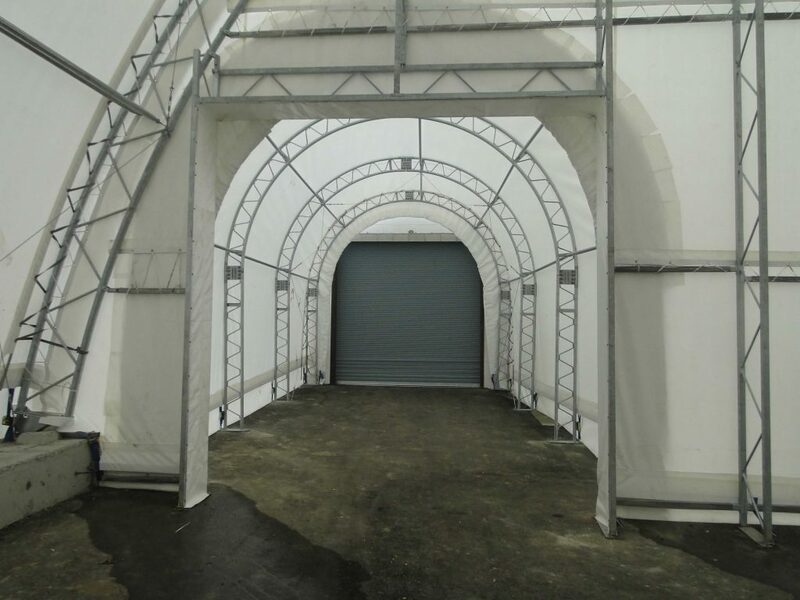 This indoor environmentally sealed structure was made for a customer who needed an indoor paint area. Big doors ensure clearance and clear windows provide lighting without the need of electrical lighting. 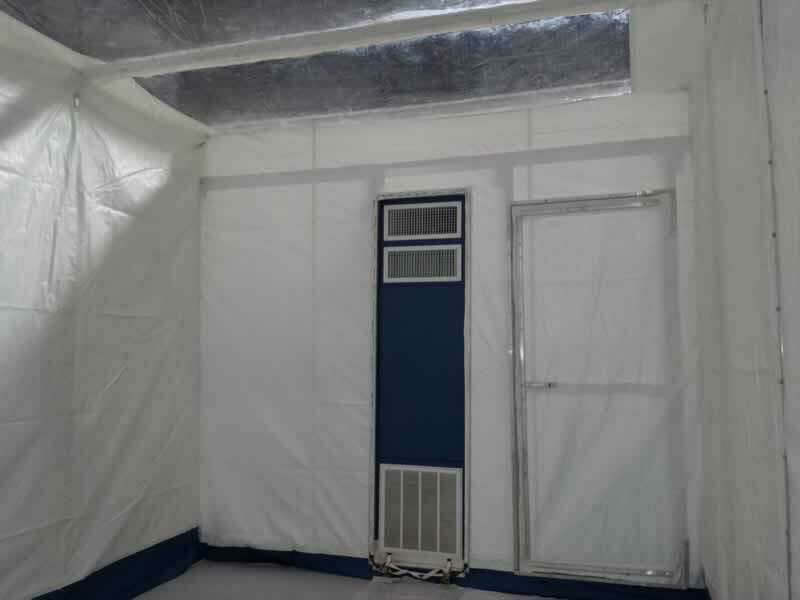 The structure was designed to be completely airtight with a custom positive pressure clean room attached to one side. 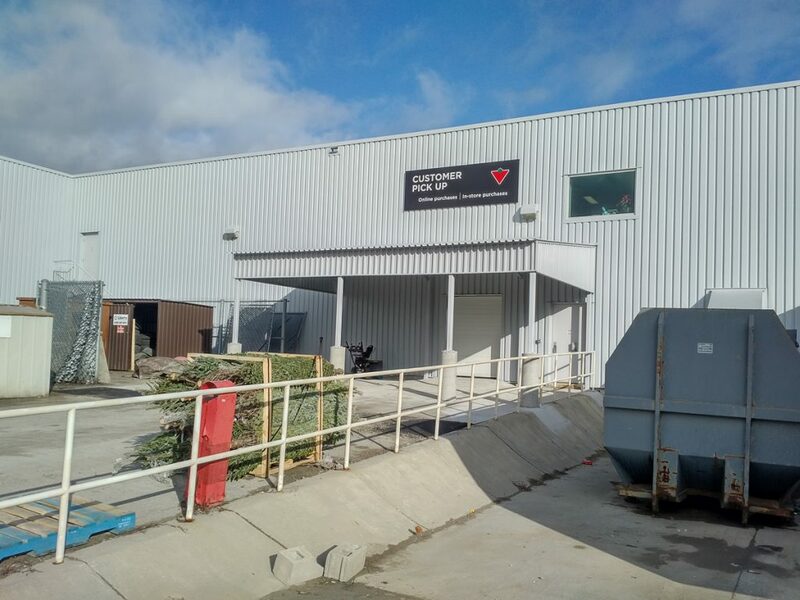 A plastics manufacturing company in Mississauga Ontario were using off site and tractor trailer vans to store their products prior to shipping. This added considerable expense to their operations. 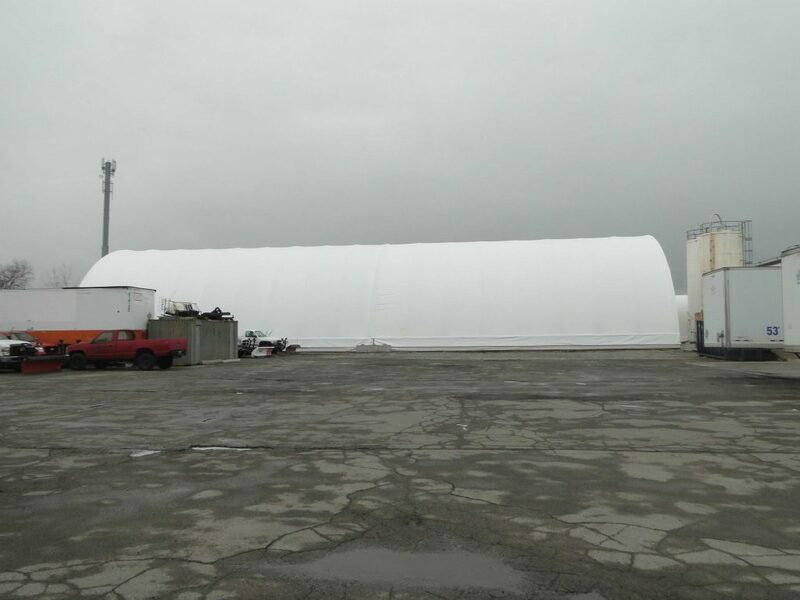 We built a 70ft wide x 170ft long (12,000 sq ft) fabric storage structure at the rear of their property. 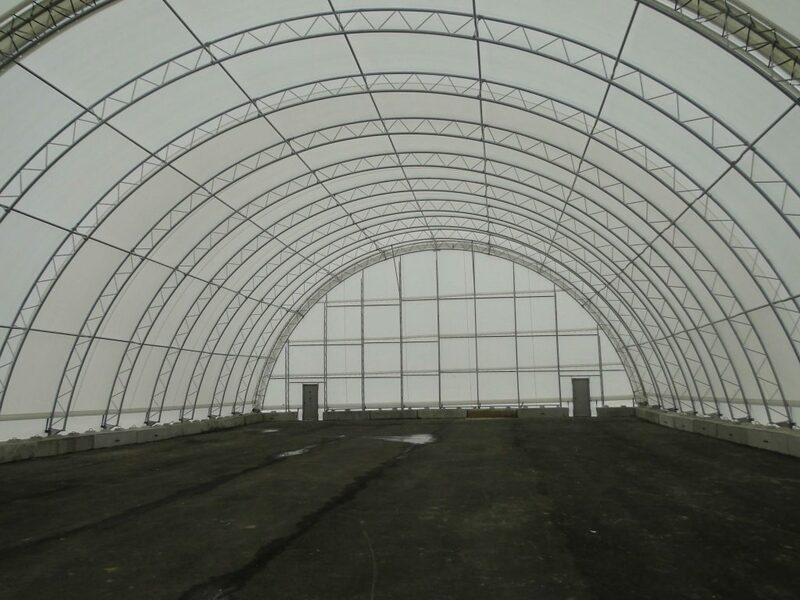 This structure is fully engineered to the snow and wind loads specific to the Mississauga area. 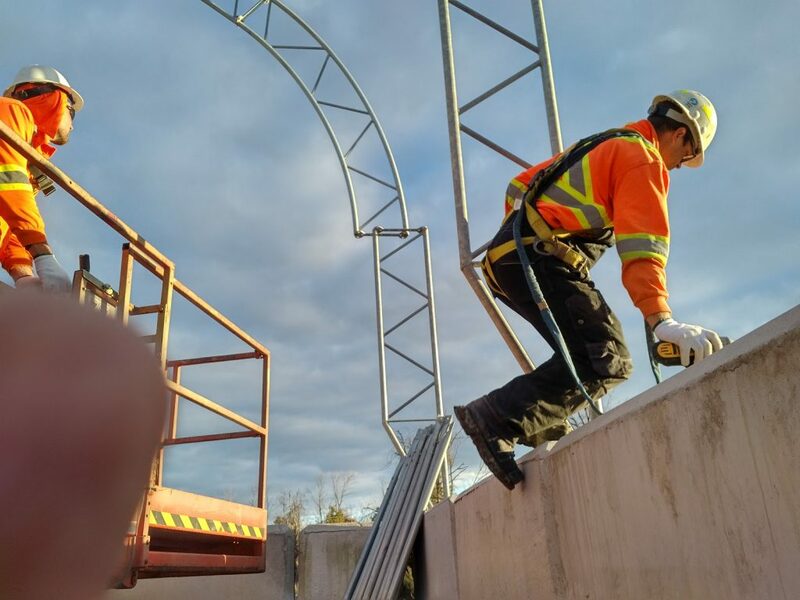 In order to allow easy access to the new storage building, we also built a connecting tunnel that ties into the manufacturing facility. A fully loaded forklift can now go from the plant to the new storage building no matter what the weather. 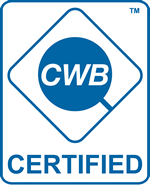 The customer is pleased with the convenience and the economy that our new facility offers. 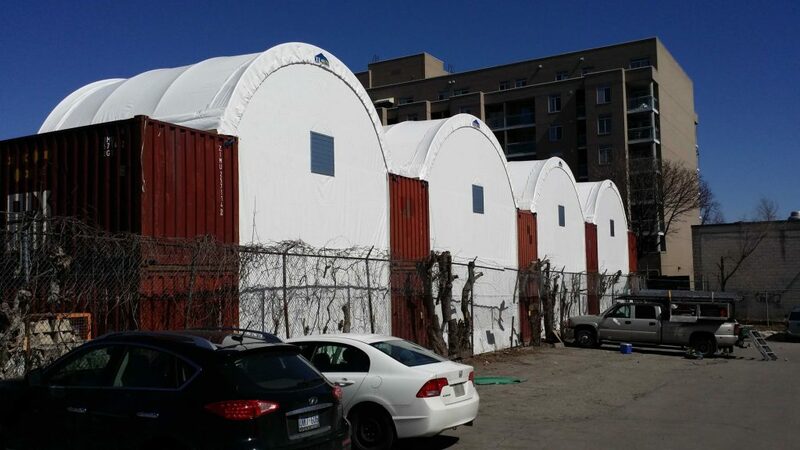 These four container buildings were built on the Danforth in Toronto for Home Hardware. The customer is located in a tight area and required compact storage areas. Double containers were erected with storage racks for lumber within. The containers are also available to allow for additional secure storage. 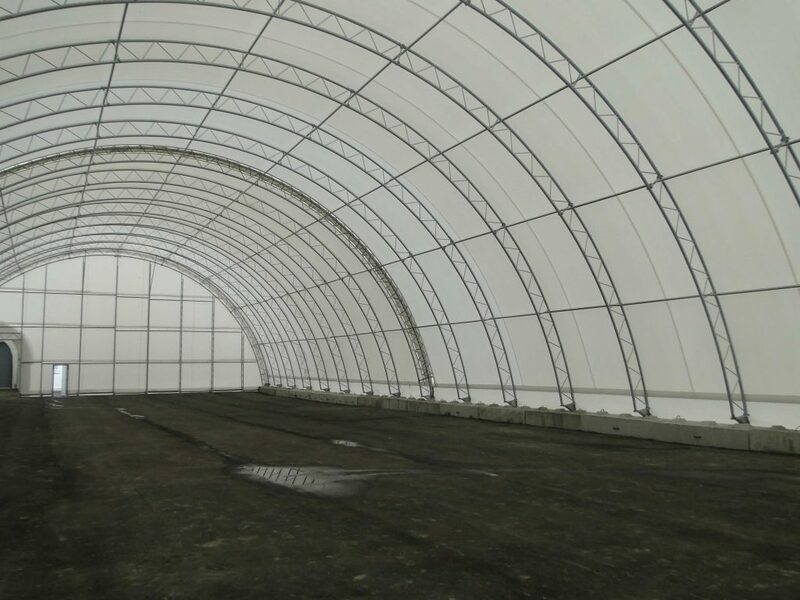 This XLSHELTER’s solution provides cover from inclement weather and adds secure compact storage.